I don’t think it matters if you are a stay at home parent or a working parent. You are always on the go and often to busy to create a snack or breakfast. Food is kind of important, you know it’s that thing that gives you energy so you can keep going all day. Not to mention skipping meals isn’t good for you at all. 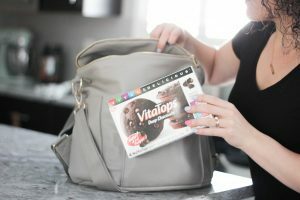 VitaTops allows me to have a mindful indulgence whether I’m home or on the go and helps keep me from skipping breakfast or snack time. Just so you know why I’m loving VitaTops… here are 5 reasons you should give them a try. 1. They stay in the freezer until use. This means they are not taking up room in the fridge or pantry. This also means they can go in your bag and thaw for on the go. 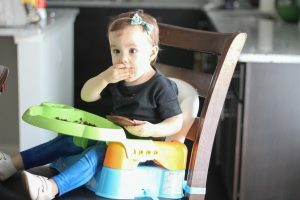 Vitatops is introducing new organic flavors and the deep chocolate has everyone in my house obsessed. 3. They are a low calorie snack or breakfast. You can find VitaTops with calories as low as 100 and up to 150. Need I say more!? That’s the BEST part of the muffin, right? 5. Each VitaTop has it’s own unique health benefits. You can find VitaTops that have up to 8g of protein. The protein VitaTops are perfect for my gym days. They also have organic and superfood MuffinTops filled with flax & chia seed. Izzy obviously loves these healthy snacks, these were suppose to be for me. She asked for a bite and wanted the rest of mine. Don’t even get me started on the hubby. He tried them and is also hooked! 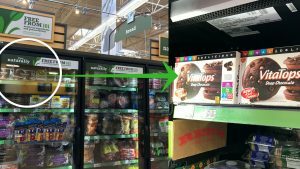 Not sure where to find VitaTops in your store? They may not be where you thought. So when shopping at Kroger you can find them in the refrigerated/frozen food organic section. 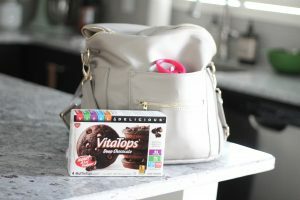 On the go or at home, I love my new mindful indulgence with VitaTops. 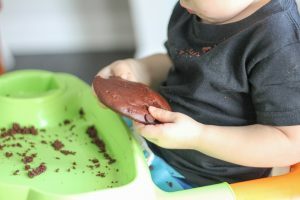 Don’t forget to snag your VitaTops coupon here. Take a break or not, but be sure to feed yourself & try out these VitaTops! These look so good! Always looking for on the go snacks! Thanks Jacki! They are so delicious.. my husband was disappointed when he found out Izzy & I ate them all. Add it to the grocery list for later ? This is one of my favorite post gym snacks too! These look really yummy!! Good choice!! These do look good….need to try them! These sound yummy! Cute video! Thank you so much! I love how perfect they are for on the go too! Yum these look healthy and good! I still can’t believe we haven’t tried these yet. They look so good!